During the course of this case, CPS relied heavily on the testimony of Ken Shaw to repeatedly inflict personal attacks on the mother. And Ken Shaw was more than happy to comply. After all, he had over the years developed an irrational hatred of the mother because of her refusal to maintain a relationship with him after she realized that he was a habitual liar, with substance abuse and anger issues. The man had even told his own parents that she lived somewhere in Canada when he first introduced her to them. Ken Shaw, at the urging and instigation of his attorney, has continued those attacks to this day, including attempting to throw false allegations out in the chat session of a radio interview conducted with the mother on Friday night. (See the "Here We Go Again" blog entry - episode 3 for details.) It is interesting that although he (or his cohorts) could have called in to the show and had their attempts broadcast live, they realized that their voices would be on air and possibly subject to further action (similar to episode 1). Meanwhile, for those of you who aren't sure what to believe, maybe the following documentation will help you. At one of the numerous hearings that was held in approximately April or May of 2013, the Judge ordered that the mother be allowed to bring a third party supervisor IN ADDITION TO her middle daughter when she had visits with her youngest daughter. Both Ken Shaw, and his wife, and his attorney were present at that hearing and heard the order from the judge. They actually objected to the idea and were overruled on the matter, so they were very aware of the judge's ruling and order. At the very next visitation, Ken and Mary dragged the child out by her wrist and screamed and yelled at the mother, telling the mother that she was not allowed to bring anyone else with her at all. 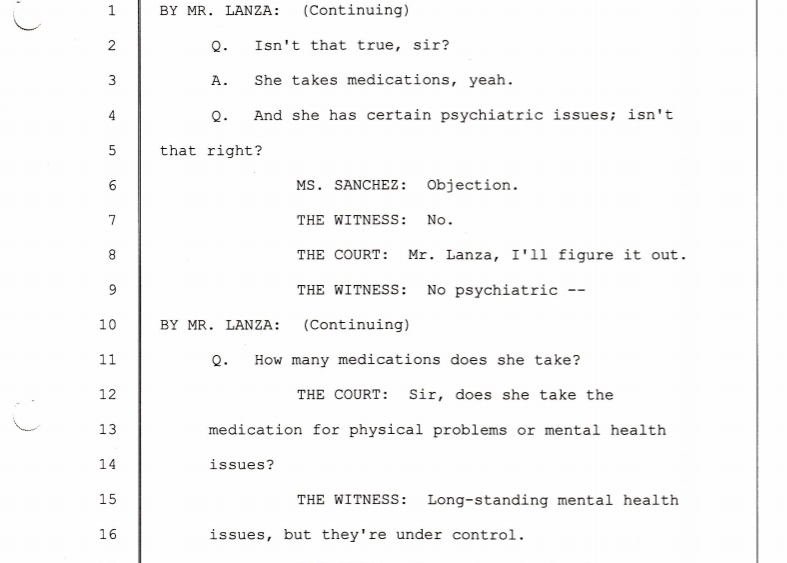 However apparently "long-standing mental health issues" that require three different medications are not "psychiatric". He uses semantics to try to deny that he lied to the police. In fact, his testimony in front of two separate judges was that the child had told his mother that the dog had scratched her. He also testified that after he "suggested" that it was from the mother (without even seeing it), both of his mother and his daughter changed their story (although his mother, repeatedly cited as a source by Ken Shaw has NEVER appeared to testify). Not to state the obvious, but a characteristic of lying is that you are unable to consistently report the same thing over and over again, because it is not grounded in reality and true memories. Ken Shaw demonstrated that less than a month later, he was unable to recall his prior testimony. Next are two excerpts from his testimony - the testimony of an adult, 50+ year old man, about how he talks to and about young girls. Neither episode is an appropriate way for a father or an adult male to talk about or treat young females. That last line from Ken was him stating that the youngest daughter heard it, not him. That he heard the mother's voice and that the child allegedly said she heard Jon Massey. This is a big change from his insistence a year prior that he heard Jon Massey himself, not only on that occasion but on others. When Ken Shaw made false allegations against the mother as part of his campaign of Parental Alienation, he repeatedly reported that he witnessed abuse. Yet this piece of testimony under sworn oath directly contradicts his reports. Now here's where it gets interesting. 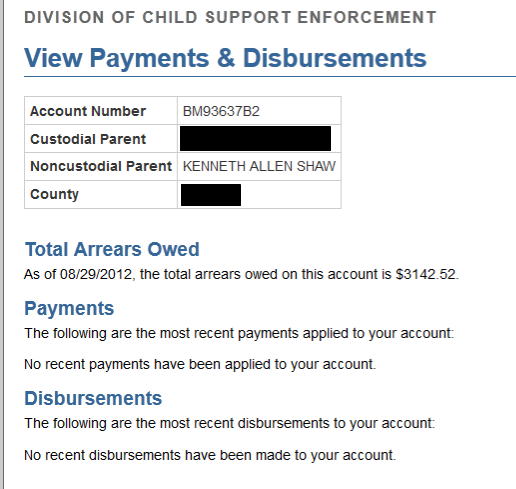 There is this documentation that at the time he got temporary custody, he was $3K in arrears in child support. But somehow, despite the mother getting no moneys from him for support, Ken Shaw and his wife were able to post this to his Facebook page in March 2012. Yet Ken Shaw claimed that he had "overpaid" the mother $3K, both in statements to CPS and in a formal notarized petition filed with the court. Here we have the testimony of this man who has admitted lying to the police, failing to pay child support, documented perjurer has demonstrated his own motives - a custody grab (and a subsequent filing for child support).